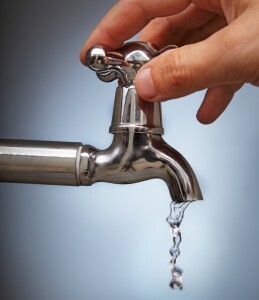 Learn about the common causes of a dripping faucet below. It’s a sound that can annoy even the most patient people, strike fear into the hearts of homeowners, and cause a frantic call to the plumber in the middle of the night. What sound are we talking about? A dripping faucet. Here are some of the most common causes of a dripping faucet. Why Are Dripping Faucets a Bad Thing? On average, leaks cause a whopping 10,000 gallons of wasted water in a home every year—enough to fill up a swimming pool! The most common leakage issue in homes throughout the country is a dripping faucet, and repairing yours could save an amazing 10% off of your water bill every month. Stem screws are used to attach the handle of your faucet and keep it in place. This stem screw has a small disc attached called an O ring. This is the main place on your faucet that is susceptible to damage. Over time, O rings become loose and wear out, causing dripping near the faucet handle. Replacing the O ring can fix your dripping faucet instantly. The valve seat is the connection between your faucet and the spout. Over time, water sediments and minerals can corrode the valve seat. If this is the problem, your faucet will leak around the spout. Clean your valve seat regularly, whenever your plumber visits, and replace it if necessary. Worn washers are some of the most common causes of a dripping faucet. Every time you use your sink, the washer is moved against the valve seat. Over time, this friction can lead to wear and tear. Dripping typically occurs around the spout thanks to the worn out washers. Replacing the washer will totally eliminate your dripping faucet. This entry was posted on Wednesday, April 12th, 2017 at 4:57 pm. Both comments and pings are currently closed.